Picture - YB-60 prototype, Convair B-36F-5 is in the background. The Convair YB-60 was an American experimental bomber prototype for the United States Air Force canceled on 14 August 1952. On 25 August 1950, Convair issued a formal proposal for a swept-winged version of the B-36 with all-jet propulsion. The United States Air Force was sufficiently interested that on 15 March 1951, the USAF authorized Convair to convert two B-36Fs (49-2676 and 49-2684) as B-36Gs. Since the aircraft was so radically different from the existing B-36, the designation was soon changed to YB-60. The YB-60 betrayed its 72% parts commonality with its piston-engined predecessor. 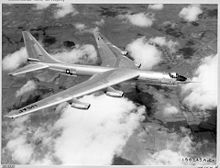 The fuselages of the two aircraft were largely identical, although the YB-60 had a longer, pointed nose with a needle-like instrument probe, instead of the B-36's rounded nose, and the tail surfaces were all new, swept to match the wings, instead of the B-36's more antiquated design. The swept wings used a lot of B-36 parts, with a wedge-shaped insert at the wing root to sweep the wings back more than the B-36's wings. 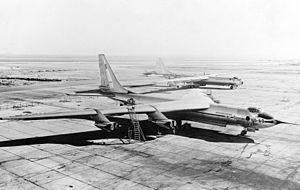 The YB-60's unofficial competitor for an Air Force contract was Boeing's B-52 Stratofortress. Convair's proposal was substantially cheaper than Boeing's since it involved modifying an existing design rather than starting from scratch. Like the B-52, it was powered by eight Pratt & Whitney J57-P-3 turbojets mounted in pairs in four pods suspended below the wing. Instead of the B-36's crew of fifteen, the YB-60's crew numbered only 10. Production B-60s were to have similar defensive armament to the B-36. Accordingly, the flight test program was canceled on 20 January 1953 with 66 flying hours accumulated, and a second prototype never completed. The airframe was built, but it was not fitted with engines or much other equipment. Since Convair had completed its prototype contract satisfactorily, both the YB-60s were formally accepted by the Air Force in 1954. The operational aircraft never flew again, and both airframes were scrapped by July. Picture - A YB-60 in flight. Jacobsen, Meyers K. and Wagner, Ray. B-36 in Action (Aircraft in Action No.42). Carrollton, TX: Squadron/Signal Publications, Inc., 1980. ISBN 0-89747-101-6. Jones, L.S. U.S. Bombers, B-1 1928 to B-1 1980s. Fallbrook, CA: Aero Publishers, Inc., 1962 (second edition 1974). ISBN 0-8168-9126-5.